What is the mechanistic implications of the higher concentration of precursors in the case of geopolymer formation? In other words how does a higher precursor concentration affect the normal mechanism of zeolite formation (nucleation and crystal growth) in order to prevent crystal growth and create a geopolymer and not just an amorphous zeolite? My first guess was that because of the high concentration the monomeric species could not orientate themselves in a ordered crystalline framework, but I am still unclear about what does exactly happen when geopolymers form and how this can be explained in terms of molecular kinetics? In terms of geo-chemistry, how would you distinguish between a crystalline product and a polymer made up of the same building blocks (i.e. Si and Al tetrahedrons) if you have to graphically represent their structural models? Will both not have the same repeating structural unit, depending on along which axis one looks? spectroscopy. The geopolymer structure is entirely tridimensional. 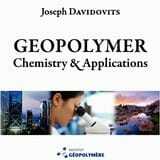 of the geopolymeric resin are due to this geopolymer type. geopolymers can depolymerise and migrate throughout the matrix and occasionally induce surface defects on the manufactured ceramic items.